When sheep were introduced in New Zealand in the late 19th century they brought twenty-nine species of internal parasites with them. Ever since, internal parasites have been the cause of sheep-health concerns for farmers. Management of the sheep, the pasture they graze on and the climate form an integral part on how the lifecycle of the internal parasites can continue and the levels of pasture contamination, and thus the infection in ewes and lambs. Generally there will be a build up in spring and autumn, with lower levels in the summer because of dryness, and in the winter because of lower temperatures. Everywhere in New Zealand the pattern of the infection is about the same, with the different species of parasites having a peak period slightly staggered right through the seasons. Larval numbers on pasture will build up during spring and summer, reaching a peak in autumn. It’s the remnants of this autumn peak that survive the winter and will start the new lifecycle and be the major source of infection of the new lambs the following spring. Lactating ewes in some years (but not every year) add to the larval population and contaminate the pasture. The species that bother sheep most are Haemonchus contortus (barbers pole worm) Ostertagia, Trichostrongylus and Cooperia. Under favorable conditions these species can suppress normal production and even cause death. Mortality rates in non-drenched lambs can reach 10 to 45% in the first year of life. The sub-clinical effects are a significant reduction in wool production, live weight gain, and fertility in later life, quite often without further outward signs. Lambs will remain susceptible to worm infections in the first year of their life, but develop immunity when 10 to 12 months old. This immunity will remain with them for the rest of their lives. Sheep need to be regularly exposed to worm challenges so that this immunity can be maintained. It can fail at times of stress because of severe feed shortages and the well-known decline in immunity of ewes at lambing time. By week four after lambing this immunity is largely restored. Lambs that have not been drenched provide the main source of contamination of the pasture. Even when drenched, lambs remain a significant source for nematode eggs and become readily re-infected between drenching. This can be avoided by increasing the frequency of drenching at danger periods or the use of slow release capsules. Since it is not practical or possible to eradicate all parasites populations at an acceptable price, the aim of control measures is to keep parasites at a level that is economical and viable for sheep production. Nutrition has an important influence on the development and maintenance of immunity in sheep and on its performance, and thus, on the effects of parasites. The reduction of stress by feeding high protein supplements to lambing and lactating ewes has been shown to give a large reduction in worm burden FECs, thus eliminating the need for the use of anthelmintics. The detrimental effects of internal worms on sheep productivity are well documented and accepted by New Zealand farmers. Recent estimates suggest that one third of sheep production is reliant on nematode control by anthelmintics. Since the introduction of anthelmintics in the early 1960’s, farmers have become totally reliant on their use for the control of internal parasites. These drenches were initially used for control at strategic times when there was the greatest risk of infection, usually in late summer and autumn. Then the use of anthelmintics was further promoted as a preventative tool, and a program of 5 drenches at monthly interval was recommended. These programs enabled further production gains by minimising the re-infection of the lambs. Still more frequent usage of drench in years of favourable conditions for worms was recommended by farm-advisors and veterinarians, and this was adopted by farmers. Surveys showed that lambs were often drenched up to seven times a year and adult sheep on average once or twice a year. Although anthelmintic resistance is now quite common on farms, drenching practices have undergone little change over the last 15 years. Internal parasite's exposure to drenches however have increased substantially in recent years with the advent of slow release capsules (CRC). Therefore selection pressure for anthelmintic resistance will be higher than it has ever been. To counter this, management strategies will have to be developed that will slow down the resistance, either by growing specialty forage crops, alternate grazing with different stock classes, pasture spelling or renovation etc. These options however will on their own not be enough to control parasite populations, and anthelmintics will be the main means of keeping nematode numbers down. To help decide whether to drench or not to drench, some farmers have monitored the level of eggs in the sheep droppings (faecal egg count or FEC) since it was shown that there was a good correlation between FECs and worm burdens. However, farmers took to drench their lambs even at low trigger FECs, e.g. less than 500 eggs per gram (other trigger levels being moderate 600 - 2000 epg and high being > 2000 egp). Although some farmers are effectively using FECs and associated trigger-levels as a basis for making decisions for drenching their lambs, the use of integrated grazing of different stock classes is still necessary to reduce parasite numbers. FECs alone however are not enough to make an accurate decision for worm burdens. Quantity and type of available food, class of stock, and their condition will have an impact on the necessity for drenching. Monitoring live-weight and available food, plus the knowledge of FEC, will help to make the decision for drenching. Long term, the continued purchase of rams from breeders that have bred for worm resistance will help to make their off-spring resistant as well, since worm resistance is a moderate inherited trait factor. Research has indicated that some drench resistance of one or more of the anthelmintic chemical classes is common on more than 50% of farms. Since drenching practices have not changed over the last 15 years, resistance to the anthelmantic chemicals will only increase. With no new safe worm-destroying chemicals in the pipeline, current nematode control measures will cease to be effective in the near future. Once substantial resistance to an anthelmintic has developed, return of susceptibility is not likely or reemergence of resistance will establish very quickly. Animals with a high level of immunity are likely to cause faster development of resistance when drenched than non-immune stock. Ever since anthelminic resistance was discovered in 1979, scientists have been warning about the consequences. Although in most cases it has been possible to replace the anthelmintic to which worm resistance has been discovered with another class of anthelmintic, on some goat farms resistance to all three classes of worm drench has been recorded. "Resistance is a genetically determined decline in the effect of an anthelmintic against the parasites that are generally effective to that drug". Sometimes resistance is defined as: "the failure to reduce faecal egg counts by at least 95%", but it has been proven that detection of resistance by FEC sometimes is not discovered until the resistance levels have reached 50% of the worm population. Resistance was first discovered in bezimidazole 1979 and has since then gradually increased, and topped 66% resistance in samples sent to health laboratories in 1993. In 1997 the figure was 42% resistance for levamisole, and 39% for the combination (levamisole + benzimadole). In 1999 the first case of resistance to ivermectin in sheep was detected - ten years after they were discovered in goats. Cross infection of multiple-drug resistant strains from goats to sheep has been thought as a distinct possibility and risk to sheep farmers. Resistant parasites are at first low in numbers and only become abundant after continued selection. This process depends on several factors, e.g. the number of genes involved, whether they are dominant or recessive, how the genes are linked, and possibly some unknown factors. If there is a single dominant gene involved as is suspected in the case of ivermectin, then once resistance is present in a population, it will spread quite rapidly. To prevent the spreading of the resistant gene between populations, quarantine drenching becomes quite important when stock is shifted between farms. Once a parasite population has become resistant to a certain drug, studies have shown that reversion (return towards susceptibility) is highly unlikely. Even if reversion occurs its duration is very short. So it can be said that once resistance is established it is effectively permanent. The aim in managing anthelmintic resistance is not to reduce drenching as such, but to reduce selection pressure for resistance. Unfortunately the first is a lot easier to achieve than the second. For instance, drenching lambs in the winter is less likely to select for resistance than drenching in the spring or summer, because less eggs will survive the winter to continue the cycle. Farmers have for years now, tried to get larvae numbers on their pastures to which their stock is exposed as low as possible. By using only anthelmintics to achieve this, selection pressure for resistance will remain high. Only if other methods such as pasture spelling, grazing with alternative classes of stock or special fodder crops will the selection pressure for resistance ease. The issue is further complicated by the fact that when pasture contamination is low, selection for resistance is high when animals are treated with anthelmintics. Research has indicated that a drench and shift (to clean pasture) policy with only two drenches can be more selective for resistance than five drenches with a rotational grazing policy. This illustrates the danger of focusing on reduced drenching frequency only, rather than reducing selection pressure for resistance. With the appearance of anthelmintics that have a longer activity (weeks or months), selection for resistance has been complicated further. It is likely that any anthelmintic treatment has the possibility to select for resistance so long as there are worms that survive the treatment. Unfortunately, whenever a drug is applied it acts not only on the worms present at the time of treatment, but keeps on screening the parasite population allowing the resistant worms to survive or develop, who can only mate with other surviving worms. Recent research results have shown that when adult sheep were challenged with a mix of resistant and susceptible parasites while the capsules were still active, only the resistant genotypes established and they produced eggs that showed a very high level of resistance; approx. 100 times higher than those from untreated animals. Even after expiry of the capsules none of the susceptible larvae established, since most of the ewes had developed substantial immunity in the meantime, thus giving the resistant worms a reproductive advantage over a long period of time. Results of trailing and modeling have shown that in general the persistent anthelmintic was associated with greater selection pressure for resistance. Also it is now well accepted that drenching adult, fully immune sheep results in greater selection pressure for resistance than drenching not fully immune lambs. Thus when drenches are used to produce pasture with a minimal parasite population (such as "safe" pasture), the result will be a rapid development of resistance. Current use of anthelmintics is causing significant selection pressure for resistance, and parasite exposure to anthelmintics is now greater than ever before. Unless new chemical classes of drugs become available, current chemical-based control of parasites will become unsustainable in the long term. Internal parasites increase the demand for nutrients, but the cell damage to the gut denies the uptake of nutrients. There appears to be a direct competition between the immune system and other body tissues for nutrients. Withstanding parasite challenge, maintaining immunity, and normal animal performance, is directly related to a high protein intake. Unfortunately there is not enough protein in pasture to satisfy the demand by young lambs and lactating ewes for the above. In the search for sustainable approaches to parasite control it has become clear that there is a strong influence between nutrition and the consequences to sheep from exposure of nematodes. Nematodes in the gut cause inflammation, damage of the cell layers in the gut, leakage of fluid, and an increase of mucus production. The repair cost to the animal can lead to a 50% reduction in growth for the same intake. Added to that comes the energy needed to mount an immune response and antibody production. Yet, despite the increase in demand for nutrients, in general the animal’s response to intestinal parasite uptake is a reduction in feed intake. The depression in intake may reflect the response to an imbalance in nutrients (amino acids) and possibly the influence the nematodes themselves have on appetite by secretion of certain molecules. In reply, lambs will select for diets with higher protein content if given the choice to deal with the imbalance of nutrients and respond with a rapid return of appetite (within a couple of days) when the nematodes are removed with an anthelmintic. It is well known that tannin-containing plants help sheep to contain infections and may provide a better protein supply. Such plants may well offer the possibility to manipulate parasite infection through nutrition. The difficulties are in the delivery of the tannins. Current plants with high tannin levels do not deliver as much dry matter (DM) as the common used forages. In addition, excessive intake of tannins leads to overprotection of proteins so that they pass undigested through the gut, this leading to reduced, rather than increased, protein uptake. Alternatively, a mixed sward with adequate protein content but limited metabolizing energy would need the introduction of new breeds of rye grass with higher available carbohydrate content. There is good evidence that weaned lambs of below 30 kg and prolific ewes during late pregnancy do not get enough protein from the current rye grass/white clover sward. The protein demand will be even higher if the animals have to withstand a worm challenge. The importance of mineral elements is still not well understood, but there is evidence that they are important in determining the outcome of infection caused by larval challenge. Many farmers/sheep breeders would have preferred clean healthy stock over dirty scruffy looking animals and culled accordingly long before anthelmintics came on the market. However, the anthelmintic drenches made parasites far less of a problem than they were prior to their arrival, and certainly made it feasible to keep animals that would have been sent down the road before. Unfortunately, by keeping such animals and their offspring, the need to intensify the use of anthelmintics was perpetuated, and, worse still, often all sheep on the farm were drenched, with as a consequence the breeding for drug resistant parasites. With consumers demanding less chemical residues in meat and the looming resistance to anthelmintics, serious NZ research started in the 1980’s. It had been known for years that the genetic ability of some sheep to cope with internal parasites existed. 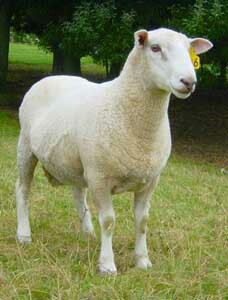 The aim was to breed sheep that were less reliant on anthelmintics without compromising the productivity of the animals. The experimental flocks at the research centers are now a good source of information on the genes involved and the practicality of breeding for parasite resistance stock. Two different host traits, "resistance" and "resilience" can restrain the effects of parasites on health and productivity of sheep. "Resistance" is the ability to limit faecal egg counts (FEC) when challenged with infective larvae and thus limiting or preventing infection. Resistance is moderately heritable and results in lower pasture contamination. "Resilience" the ability to maintain a reasonable productivity when subjected to a parasitic challenge. It is less heritable and more difficult to measure. Resilience will lead to higher productivity and fewer dags, but not necessarily lower FEC. "Resistant" lambs are those able to maintain a relatively low worm burden despite grazing pasture contaminated with roundworm larvae. Most research has focused on the use and measuring of FEC as the most practical indicator of resistance. Lambs with a below average worm count in an untreated flock parasite challenged for a period of time are considered to be above average for resistance. It has been found that FEC in lambs challenged by roundworms has a heritable factor of between 23 and 35%, which is not all that different from other productivity traits in sheep. Farmers can be confident that the environment has little effect on resistance for round worms, and a high-ranking ram on the breeder’s farm will also rank high anywhere else. Genetic correlations indicate that genetically resistant lambs have similar growth rates to susceptible counterparts, but have lower fleece weights. However, it is still possible to make genetic gains in all productive traits by using a selective index. Also, there are, of course, significant benefits from reduced pasture contamination in the long term. Resistant lambs have not resulted in less dags. There is a favourable genetic association between FEC and ewe fertility. Low FEC genotype ewes consistently weaned more lambs, which is of considerable economic significance. There is no evidence that roundworms will rapidly counter the effect of resistant sheep. Resilience to roundworm challenges has been studied in NZ since 1991 after some farmers were attempting to selectively breed from sheep that had grown well as lambs when left un-drenched. In theory resilience could be determined by exposing lambs to a severe roundworm challenge for a long period and identify those least affected. In practice this method is unacceptable on animal welfare and economic grounds. Studies on the genetics of resilience used a "drench on demand" procedure. Lambs were drenched only when visually necessary. This approach allowed the most resilient lambs to be subjected to a long period of challenge without drenching, but avoided the serious suffering of the less resilient lambs. This method allowed the resilience trait to be expressed in terms of "drench requirement under challenge". However a major drawback is that frequent flock inspections are necessary to avoid serious worm infections in some animals, and it is difficult to rank other production traits since not all animals received the same treatment. Heritability of resilience traits is quite low (10 to 19%), but if the severity of the challenge is increased (but also the risk of survival of the animals), a considerable higher figure (24 to 53%) was derived at. Then, the heavier lambs tended to cope better with a worm challenge. Simply selecting the "well doing" lambs causes a bias towards lambs that have been well grown at weaning, selecting against late born, twin and triplet lambs. Selecting for resilience resulted in no genetic change in the FECs, but did improve the productivity and dag score. Genetic progress by breeding for resilience has been achieved, and lambs in the elite resilient flock had less dags, needed 45% less drench, and were 27% heavier than control line lambs. Until genetic markers for resilience become available, the most sensible solutions for breeders is to use a "selection index" which combine FEC and production under a limited round worm challenge. Animals with low FEC but excessive dags should be avoided. To help ram breeders, a service (Worm FEC, AgResearch, Invermay, NZ) has been established to identify animals that are both resistant to round worm infection and highly productive under parasite challenge. The service provides breeders with faecal egg counting service and the calculation of breeding values for several different resistance traits. Repeated measures and BLUP (Best Linear Unbiased Prediction) analysis is used, making it easy to assess long term trends and across flock comparisons. It is estimated that up to half the genetic susceptibility to worms of the average flock would take about 20 years using current technology. It should be possible to develop genetic markers to classify animals according to genotype before selection by using a simple DNA test (blood sample). Research is currently underway to identify these genes. The technology is however not available as yet in New Zealand. The current farming practice of drenching will give strains of nematodes the opportunity to become resistant for anthelmintics. The emergence of resistance to anthelmintics will reduce their efficiency and has serious repercussions on livestock productivity. Consumer pressure to minimize chemical residues in meat could be used as trade barriers. New technologies will become important as the reliance on anthelmintics fades. If sheep farmers want to maintain a high stocking rate to keep farming, viable new methods of nematode control will have to be found. A lot of research and development will be needed to done before any of the possibilities can be developed into useful practice. 1. There are fungi that show some prospect of success against nematode larvae. The fungi are ingested by sheep, survive the journey through the gut, settle in the faeces after excretion, and use the nematode larvae as their main source of feed. These predaceous fungi have the potential to be part of a useful management system. They are, however, very sensitive to temperature and slow growing and may not be effective everywhere in New Zealand. There is also a problem on how and when to deliver the fungi into farming systems. Earthworms and dung beetles are also possibilities, as their burrowing activities will kill many larvae, but the amount of rainfall and aeration can have a variable effect. And some larvae will survive by avoiding the lethal effects of ultra violet radiation. 2. Succesful vaccines have been developed for the dog tapeworm. Despite many years of research, similar success to develop a vaccine against the major group of sheep parasites has not been achieved. The levels of immunity (antigens) after vaccination have not been high enough to give protection. With increasing knowledge of the genes involved it is hoped that a vaccine will eventually be developed. 3. Biological anthelmintics use natural molecules that interfere with natural processes. The molecules, enzymes, antibodies and peptides interfere with the normal worm metabolism, larvae development, egg production etc, but also could be used to prevent the mechanism of the worm resistance from working. A great number of natural biological extracts are being screened, potentially leading to identifying leading compounds. The genome of a close relative of the internal nematode parasite has recently been published and this will substantially enhance the speed of future research. Modern technologies enable scientists to work on identifying proteins that interfere with the normal worm living process. Gene slicing is another technology that could make an impact on the development of biological anthelmintics. Specific targeted gene slicing could be used to identify useful gene targets of anthelmintics. Resulting in products from which drugs could be designed. Another possibility is that the gene products could be incorporated into grazing plants, which would then interfere with critical worm genes. 4. The immune response of sheep against the invading parasites causes many changes in the gut with many undesirable consequences. No doubt the parasites do some serious damage but some animals give extreme reactions to even mild invasions of parasites. This exaggerated allergic type response to nematode antigens causes severe scouring and a decline in health, muscle, and wool growth. By adopting similar methods that are used to treat human allergies or targeting the molecular intermediates, it may be possible to develop the same therapies for grazing animals. 5. One way of preventing the uptake of larvae is to have animals graze herbage that slow down the migration of the infective third stage of larvae. It has been proven that lucerne, clover and chicory, amongst others, do just that. Another way to reduce the intake of nematodes is to graze various classes of lifestock, since most parasites are host specific. Management systems whereby sheep follow cattle, stock stay only briefly in a paddock or transferred to ungrazed areas, with young stock following older stock, will all help to minimize the uptake of infectious larvae. In conclusion, it can be stated that if farmers want to keep their farms profitable there is a certain urgency to find new ways to keep nematodes at bay and maintain stock health. Much more research and development needs to be done before promising new possibilities become a reality.